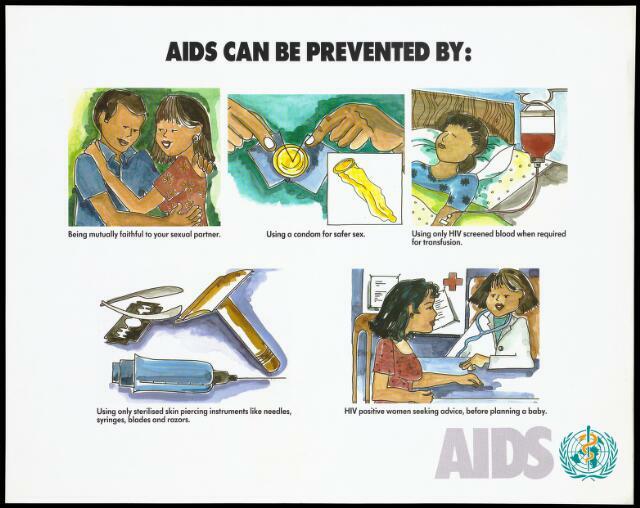 A faithful couple, opening a condom packet, a woman receiving a blood transfusion that has been screened for HIV, sterilised skin piercing instruments and an HIV positive woman seeking health advice before planning a baby; advice by the World Health Organization about the way AIDS can be prevented. Colour lithograph, ca. 1995. AIDS can be prevented by: being mutually faithful ... using a condom ... using only HIV screened blood ... using only sterilised skin piercing instruments ... HIV positive women seeking advice ... AIDS.